The use of a Real-Time Operating System (RTOS) is increasingly common in embedded software designs. An RTOS makes it easy to divide your code into smaller blocks, tasks, which execute seemingly in parallel and independent of each other, as described in the first article in the RTOS 101 series. The initial loop (line 1) may seem to give exclusive access to the COM1 interface (line 3), but if using an RTOS this is often not a safe solution. It probably works most times, perhaps often enough to pass all testing, but if an interrupt strikes after the initial loop on line 1 but before the assignment at line 2 and this results in a task-switch, a second task could get into the critical section before the first task is finished. Implementing a thread-safe critical section requires either disabling interrupts or using special instructions for atomic “test-and-set”. Considering this, it is typically easier (and safer!) to use the RTOS services intended for this purpose. Semaphore: The RTSS semaphore object is a synchronization object that maintains a count between zero and a specified maximum value. The count is decreased by one each time a thread completes a wait for thesemaphore object; the count is increased by a variable amount at the semaphore release. When the count reaches zero, the semaphore object’s state is no longer signaled and no more threads can complete a wait on the semaphore object until some thread increases the count. Mutex: The RTSS mutex object is a synchronization object whose state is signaled when it is not owned by any thread and not signaled when the mutex is owned by a thread. The mutex object arbitrates exclusive access to a shared resource. Priority Inversion is what caused NASA problems on the Mars Pathfinder mission. This means that a higher priority task is accidentally delayed by a lower priority task, which normally is not possible in RTOSs using Fixed Priority Scheduling. This may however occur, e.g., if the high-priority task (“Task H”) needs to take a mutex that is currently held by a lower priority task (“Task L”). This blocks Task H until the mutex is available, and is often not a problem in itself since a mutex is typically only held for brief durations during a critical section. However, as illustrated above, the blocking may become a lot longer if an unrelated medium-priority task (“Task M”) comes in and preempts Task L, thereby delaying the release of the mutex that Task H is waiting for. This phenomenon is called Priority Inversion. Most RTOS provide mutexes with “Priorty Inheritance” (or other similar protocols) which raises the scheduling priority the owner task if other higher priority tasks become blocked by the mutex, which avoids that medium-priority tasks interfere. Priority Inversion can also occur with queues and other similar primitives, as described in Customer Case: The mysterious watchdog reset. Percepio Tracealyzer allows you to see most RTOS calls made by the application, including operations on semaphores and mutexes, in the vertical time-line of the main trace view, in parallel with the task scheduling, interrupts, and logged application events. 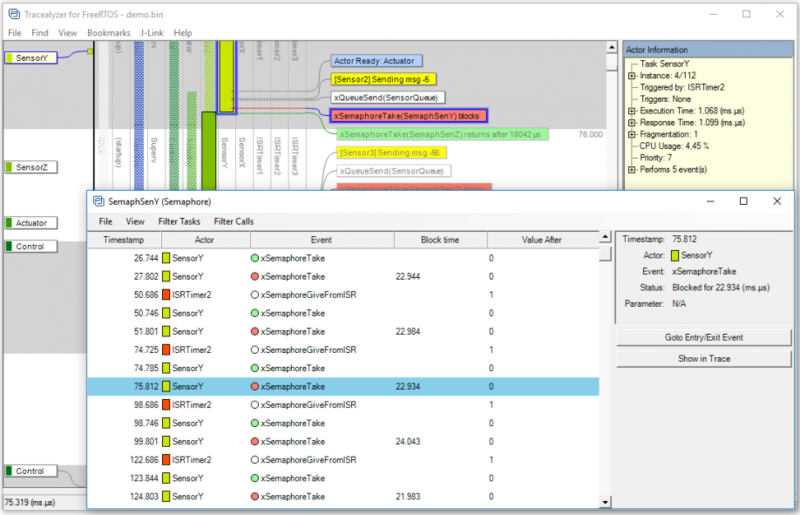 By clicking on any semaphore, queue or mutex event in the main trace view, you open up the Kernel Object History view for the selected object, as illustrated below, showing a separate timeline with all operations and states of this specific object. You can double-click in this view to find the corresponding event in the main trace view. For queue objects, you also get a visual display of the number of messages in the buffer at any point, and you can even track messages from send to receive or vice versa. For mutex objects you see the name of the current owning task. Tracealyzer also provides an overview of the interactions between tasks and interrupts via kernel objects such as queues, semaphores and mutexes. This gives a high-level illustration of the runtime architecture based on the trace, and you can even generate this for specified intervals in the trace. An example is shown below. Rectangles indicates tasks and interrupts, while ellipses indicate queues or semaphores. Mutexes are shown as hexagons. Since sometimes binary semaphores are used as mutexes, the classification of Mutexes are made based on their usage pattern, so semaphore objects may also be displayed with hexagons if they are used like a mutex, i.e., taken and given by the same task. With Tracealyzer you get a superb solution for debugging, validation and performance analysis of RTOS-based embedded software. You get an exact picture of how the RTOS is executing your application, including the interactions between tasks via semaphores, mutexes and queues, as well as blocking and timeouts. This gives invaluable insight into the runtime world and facilitate development, validation and debugging of RTOS-based embedded software. Tracealyzer is also available for analysis of Linux systems.